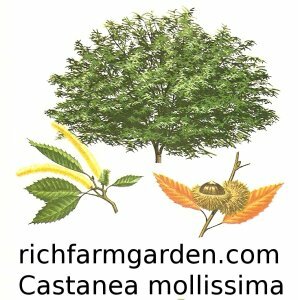 Chinese Chestnut - Castanea mollissima - A fast growing tree producing delicious nuts that are a favorite for roasting or boiling. For best pollination, plant 2 or more. Hardy to -30F (-34.4C); height: 20-25ft. American Chestnut - Castanea dentata - At one time, millions of these great 'Kings of the Forest' grew in the Appalachian Mountains, some nearly as large as Sequoias. Most were destroyed by a blight introduced in the 1920's, and now only a handful remain. Extensive efforts are being made to save and revitalize the American Chestnut. Most trees planted only reach about 35-40ft. in height before dying. The largest known tree is in Jackson county Tennessee. Hardy to -30F (-34.4C); height: 40 ft.